60% start with balls(7/12) Pass to an open player, that player receives and turns 90-135*, all turns going somewhat backwards on their first touch. All traps need to be slightly out in front of their body in the direction they want to go. -Inside of foot cryuff behind standing leg more backwards. 4 minute games, count goals for each team then switch roles/sides. 25 yards wide by 12 yards long. Coach passes to blue player who starts in the middle of the grid. Ball is live/defender is released on coaches pass. Dribbler gets 1 point to dribble into the goals. 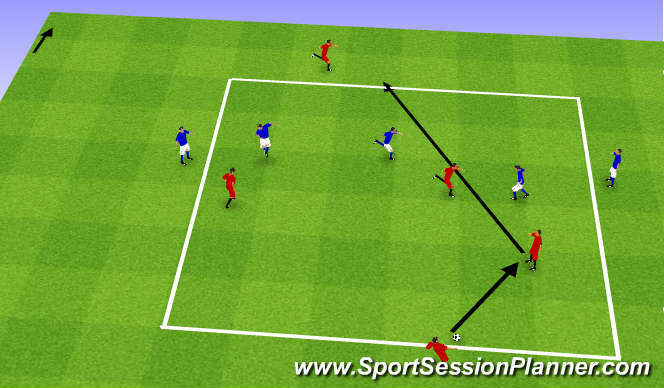 Defender can steal and counter attack to opposite goals. Coach should be pushing players to beat defender by touching past defender on first touch, quick change of direction and keeping body in between ball/defender. When play ends, next attacker is immediately in. Red going up/down, blue going left/right. Square field. Red is trying to score points by passing from perimeter player to opposite perimeter player. Blue does the same thing in the opposite direction. 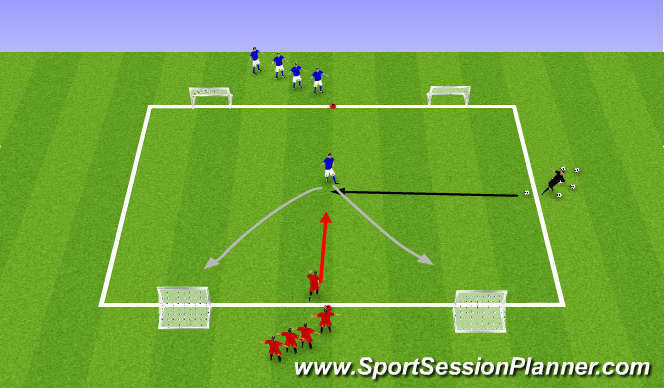 Ball must travel from one side to the other without losing possession to receive a point. Play for 3-4 minutes then switch. Focus on off-ball movement, communication, and most importantly turning away from pressure/towards other target player.